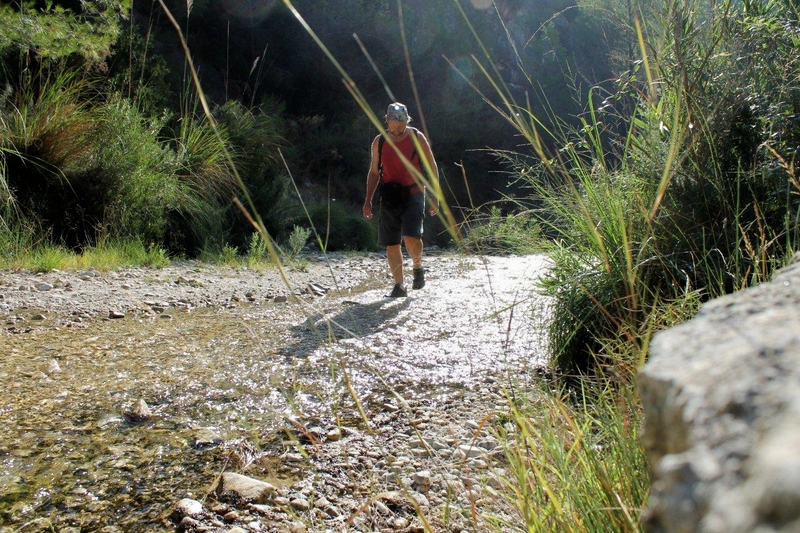 THERE is something heroic about a ramble up the riverbed of the Rio Higuerón. When I say heroic, I mean in the literary sense – as in the quest for the Holy Grail; CS Lewis’ Voyage of the Dawn Treader; Tolkien’s Lord of the Rings; Jason’s search for the Golden Fleece; Don Quixote’s wanderings in the sierras. 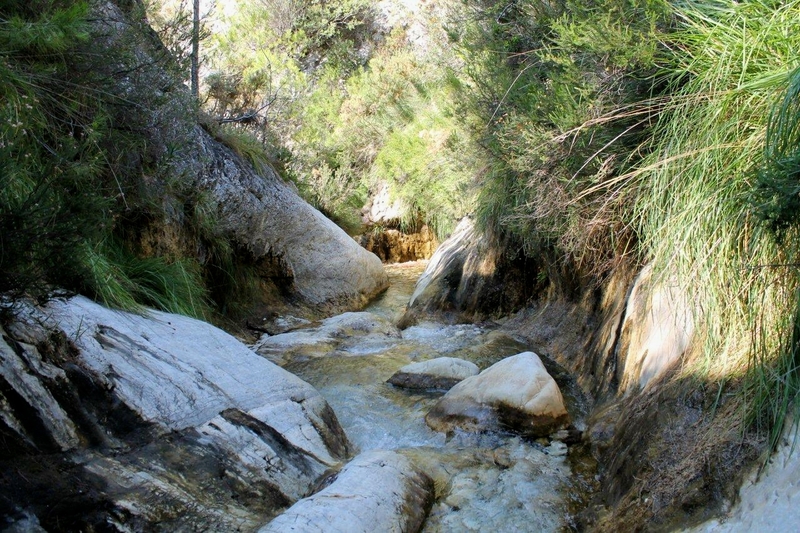 Not only is a ramble up the Rio Higuerón an adventure at every turn, it’s a proper childhood adventure. Get this for a guidebook introduction . . .
Like most practising adults, I generally take ‘infantile’ to be a pejorative adjective, but when it comes to messing about in rivers, I’m all for a rapid regression into childhood, even for the most august grown-ups. 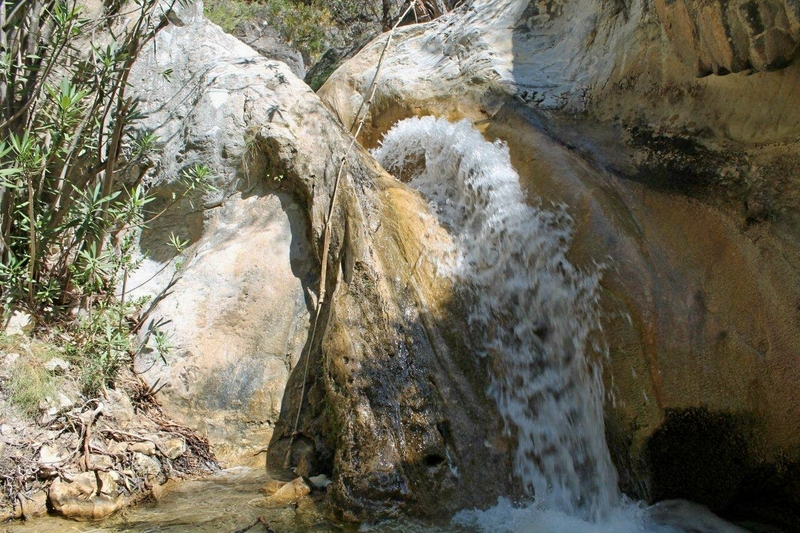 If you suffer a lurking urge to splash your way through that puddle or have fond memories of paddling through streams in your nonage, then this is the outing for you, largely following the pathless course of the Rio Higuerón, named for the fig tree said to grow at its source. 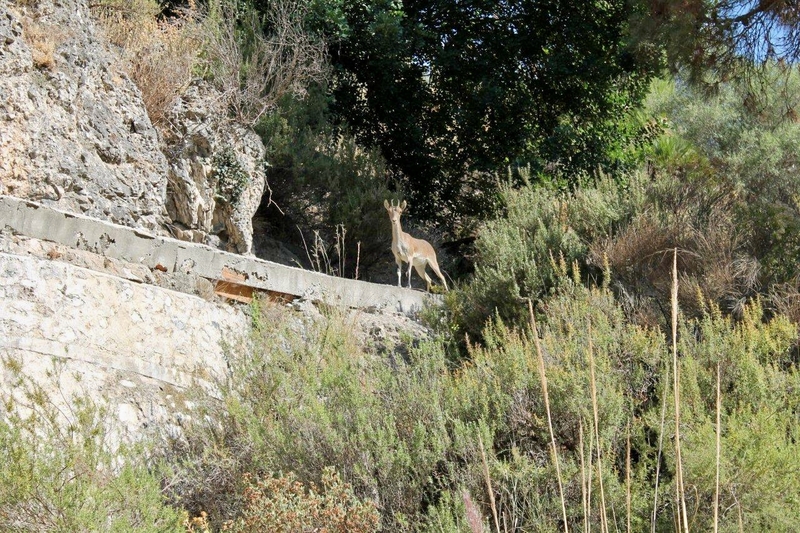 So says Charles Davis in his Walking the Axarquia (the Sierra Tejeda y Almijara). 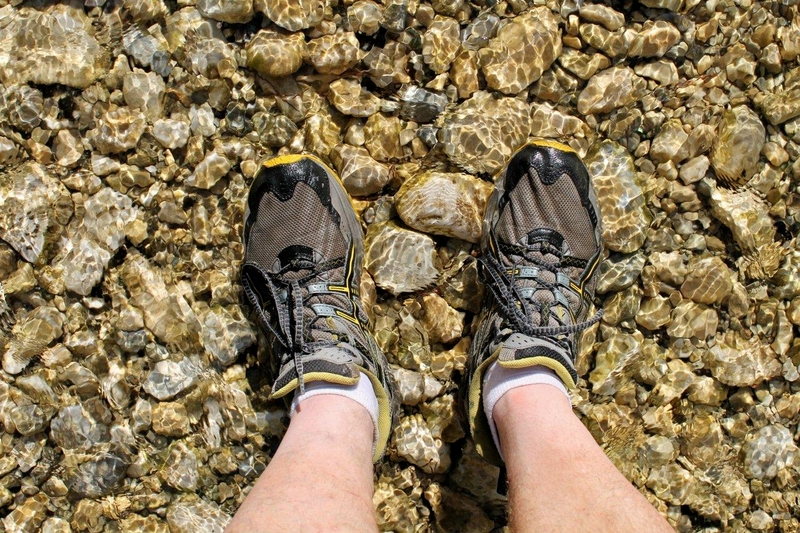 So for the first time in 37 years of hiking I leave my boots in the car and pull on my trainers for a ramble up a riverbed that has seven waterfalls and a fig tree at its source. This walk has captured my imagination. Seven is a number that possesses mythical connotations – seven for the seven stars in the sky; the seven samurai; dance of the seven veils; the seven wonders of the world; Snow White and the seven dwarfs; Seven Brides for Seven Brothers; seven ages of man; the seven days of creation; seven years’ bad luck; the seven virtues; the Magnificent Seven. Not only that, but at the source of this mountain river there is said to be a fig tree. 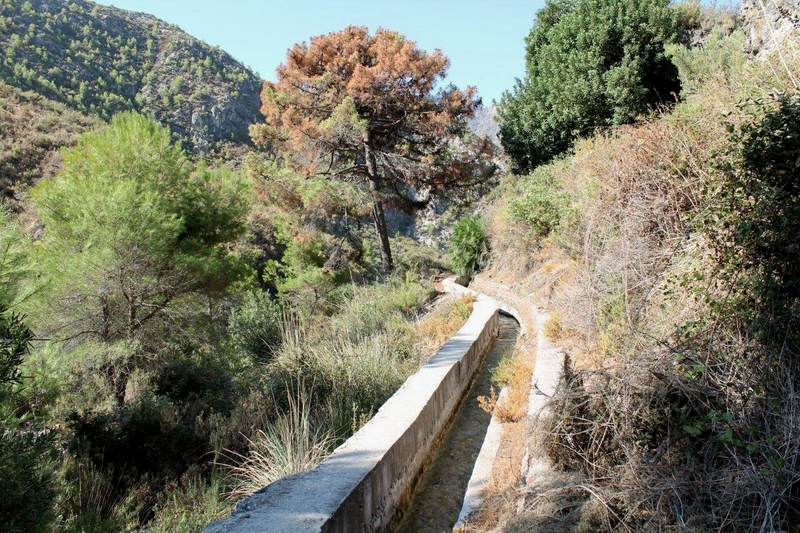 I leave the car in the village of Frigiliana just as old men are beginning to emerge into the morning sun, and descend one of the steepest backstreets in the known world to the Rio Higuerón. But the river is dry. There is not one drop of water. I stand in a broad ribbon of white rocks and dust, wondering what sort of fate befell all the fish and whether the sacred fig tree has withered on its mountain top. And I think: if the attraction of this walk is splashing thought puddles and climbing waterfalls, is there any point continuing if the river has dried up in the September sun? I plod up the riverbed, shoes crunching the pebbles, because Don Quixote wouldn’t have turned around and driven back to the holiday cottage in Orgiva to interrupt his wife’s girlie day out with her mates, and neither would Prince Caspian. Mind you, I don’t think either of them was married and so had not partaken in conversations about the latest Victoria Hislop novel and the merits of Spanish clothes pegs. 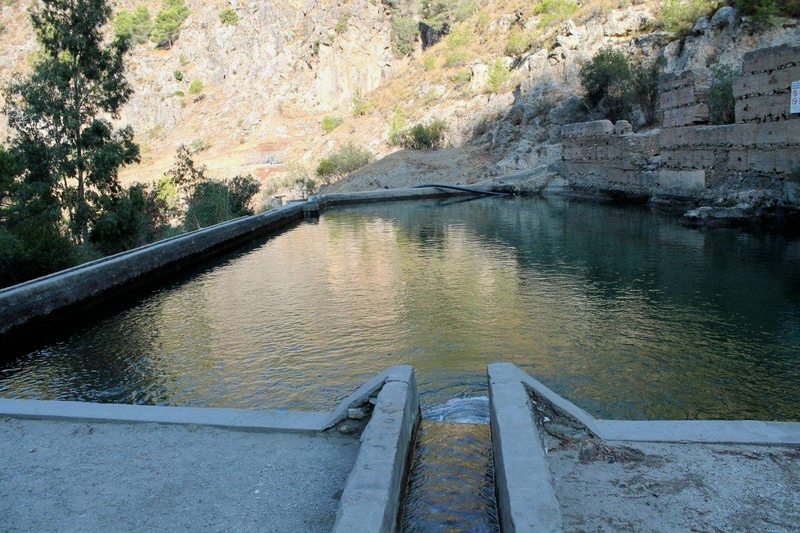 I crunch on for about a kilometre and arrive at a pleasant concrete reservoir fed by crystal water flowing from an acequia. For those not familiar with acequias, a few words of explanation. 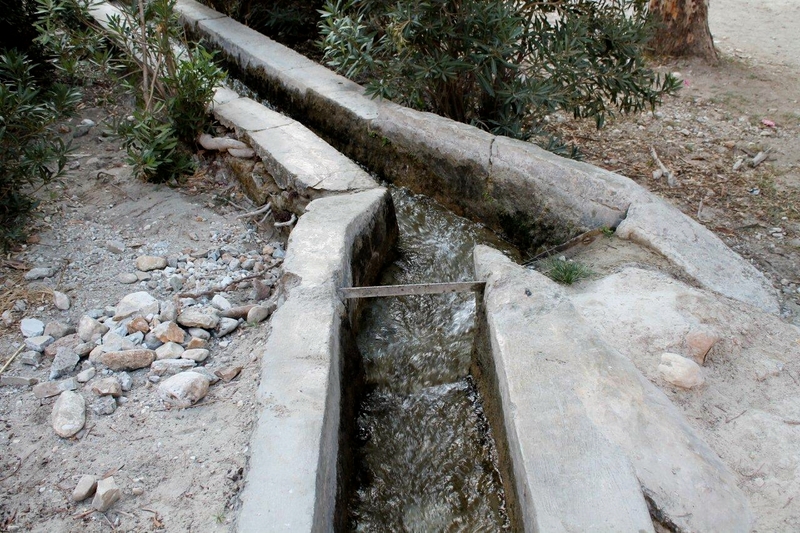 Pronounced ethekia, an acequia is an irrigation channel that conveys mountain stream water to the villages and pasturelands of rural Spain. The earliest are said to have been engineered by the Moors, or possibly the Romans. They are similar, if not identical, to the levadas of Madeira. Now I am aware that this might not always be apparent, but my mind usually works in a logical manner. 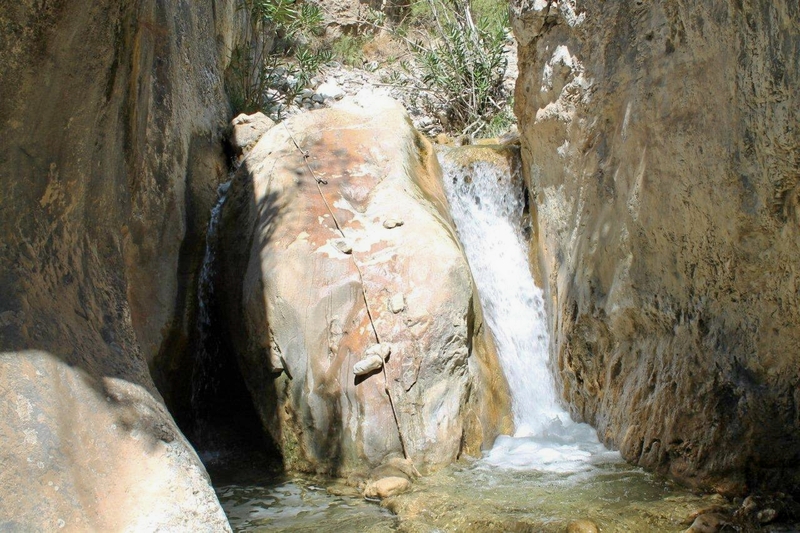 I behold the reservoir and the voluminous stream issuing from the acequia, and I think: perhaps this water is the final sighing breaths of the Rio Higuerón, and if I follow the acequia I will arrive at crystal pools fed by pure water from the roots of the fig tree. So this I do. And twenty minutes later, at the head of the acequia and a makeshift dam fashioned from rocks and fertiliser bags in the middle of the riverbed, I do indeed arrive at the living river. I splash up the river like a child, a little self-conscious at first but then taking riotous steps that actually send water as high as my knees. And it’s really, really pleasant. I can recommend it as an alternative to mountain walking. Admittedly, floundering up Tilberthwaite Gill on a damp November morning might not produce the same satisfaction, but a stroll in a warm stream at the close of a Spanish summer is a complete indulgence. After an hour of sloshing and crunching, I arrive at a second makeshift dam where another acequia is greedily diverting large amounts of water, and above this point the stream is in its native, copious state. This is how I imagined the Higuerón would be – rattling torrents that cool the September air; deep pools in which to wade and sometimes flounder inelegantly; wet rocks to clamber over like a granddad trying to prove to an unseen audience that life doesn’t end at 40 . . . or 50. Okay . . . 55 and eleven-twelfths. 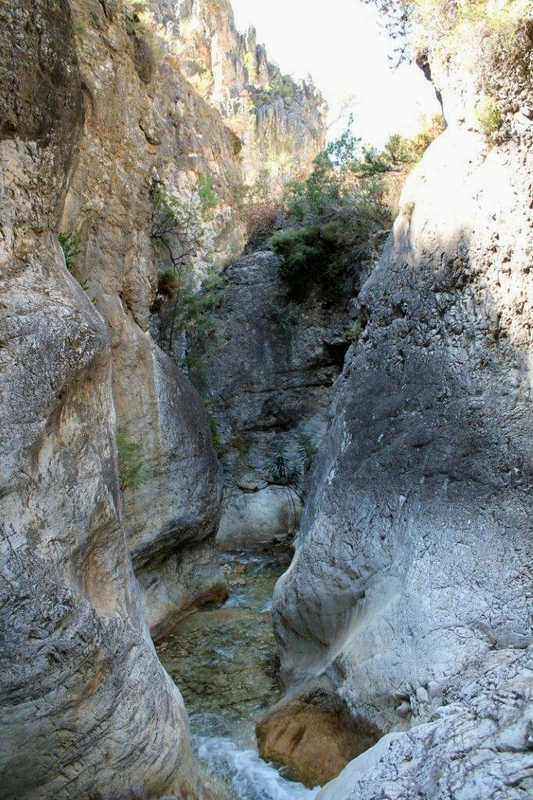 Then the Rio Higuerón narrows to a vertical-walled gorge and the water becomes deeper. In some pools I am up to my waist. 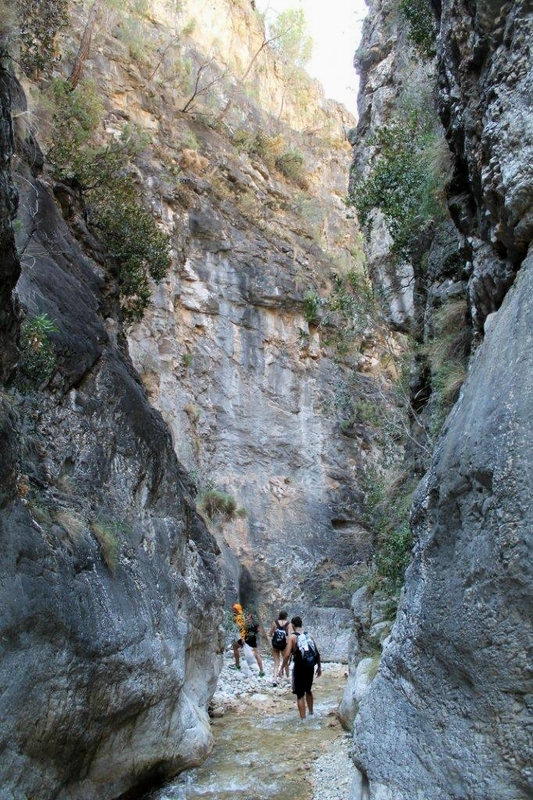 The rock walls close in – and I reach the first of the waterfalls. I don’t wish to over-dramatise this, but some falls are a doddle while others are pretty bloody arduous – requiring total physical strength to heave your body up slippery rocks while the full flow of the river attempts to wash you back down again. 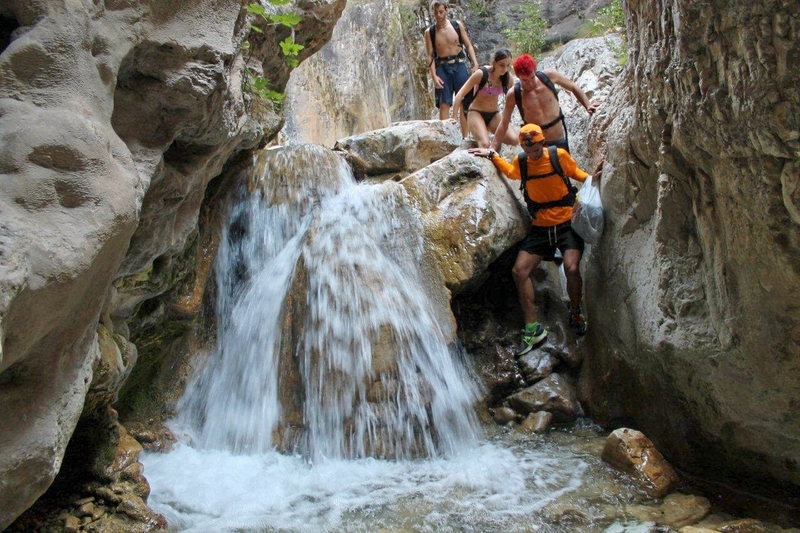 The fifth and sixth waterfalls are the hardest and steepest – and on both, fixed ropes are in place for the adventurous to haul themselves up. The ropes are badly frayed where they pass over ledges and both are anchored to flimsy-looking tree roots. But what the hell. Do we live for today, or do we talk clothes pegs? The seventh waterfall is unclimbable. This is the end of the adventure. Graffiti on the walls of the gorge at the waterfall’s foot is a welcome source of reassurance that I don’t have to climb any more – other people have reached this point and left their mark before turning back. And there is no fig tree. No golden fleece, no rainbow bridge, no Turkish delight, no Holy Grail – just a thundering great waterfall. Mind you, after starting out in a completely dry riverbed, that’s more than enough magic for anyone. IT has not gone unnoticed that there are bloggers out there who have been gently poking fun at my obsession with old railway goods trucks parked in remote locations. 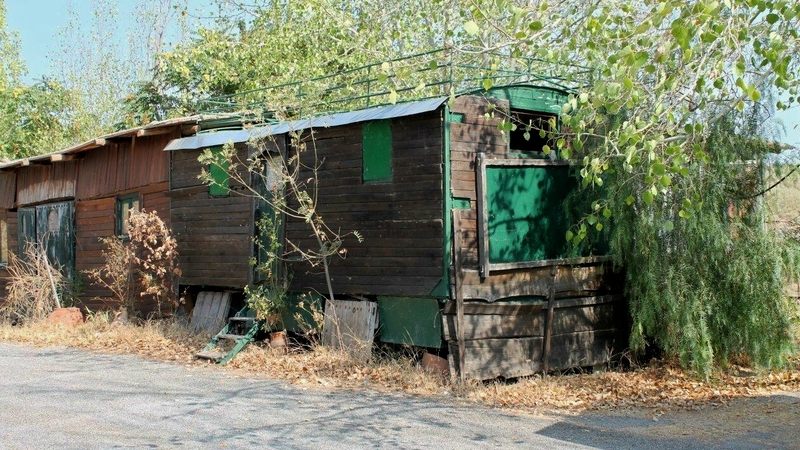 My response, amigos, is to offer this unparalleled example of a Spanish railway wagon at Los Llanos, at the side of the Orgiva to Pampaneira road, in the Sierra Nevada mountains at an altitude of 910 metres (2,985ft). Another 15ft and it would have had Munro status. This entry was posted in Climbing, Environment, Hiking, Levadas, Mountains, Railway goods wagons, Railways, Walking and tagged Lake District, Madeira, outdoors, Sierra Nevada, Sierra Tejeda y Almijara, Spain, The Lakes, transportation. Bookmark the permalink. 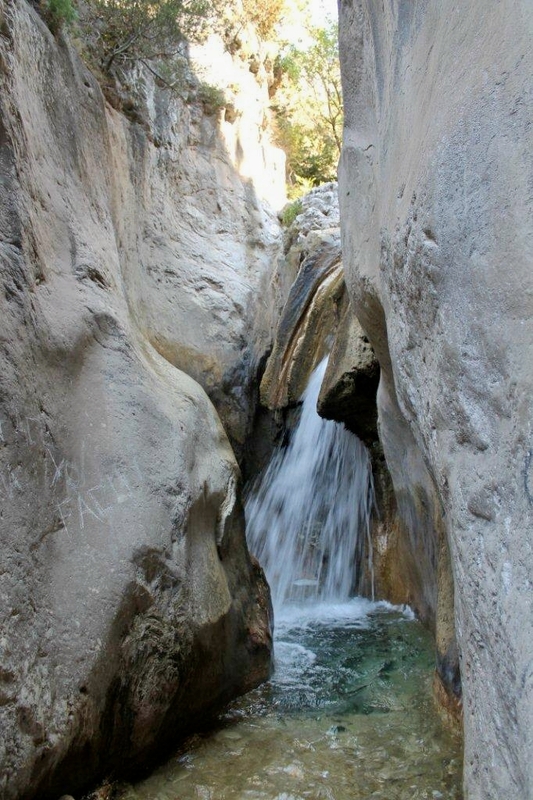 Cannot beat a good gorge, years ago I visited Sakklikent in Turkey and last year went to the Narrows in Zion National Park in Utah…..magic! Excellent stuff. I’ve never done a walk like this before, except a touristy type walk in the Pyrenees that had walkways all along the gorge so you didn’t get your feet wet, which wasn’t the same thing at all. There’s another over the ridge from the Higuerón called the Rio Chillar, which I believe is similar though with deeper water. That’s on the list for next year. I love this post, can I give it two likes? You can give it as many as you like, my dear. Ah, but there were wellies that made rings round your legs . . . and isn’t it funny how you never felt cold. Wonderful stuff. Some favourites: Samaria gorge in Crete, Hell Gill in Mallerstang but the best for me is floating on my back in the Chassezac gorge in France with an eagle silhouetted against a perfect blue sky. Hi JonJo. It appears there’s more to this gorge walking business than I’d realised. I did go through a period of climbing stuff like Piers Gill and Custs Gulley in the Lakes when I was younger, but I think floating in the Chassezac gorge while watching eagles might just have the edge on that. I apologise if I make you uncomfortable, but here comes a lot of flattery:-) I guess that’s in order with all that rain you have got. Hope you are ok.
It’s a wonderful story you have written. I think one has to do as Dalai Lama recommends, travel to a new place every year. Your travel descriptions is great, and while reading them I come to think of some fantastic voiceovers for good movies as in the opening in The Lords of the Rings. One of my favourites is your introduction to the travel description from Madeira: Walking with Water. Its like being a blind passenger in the car. 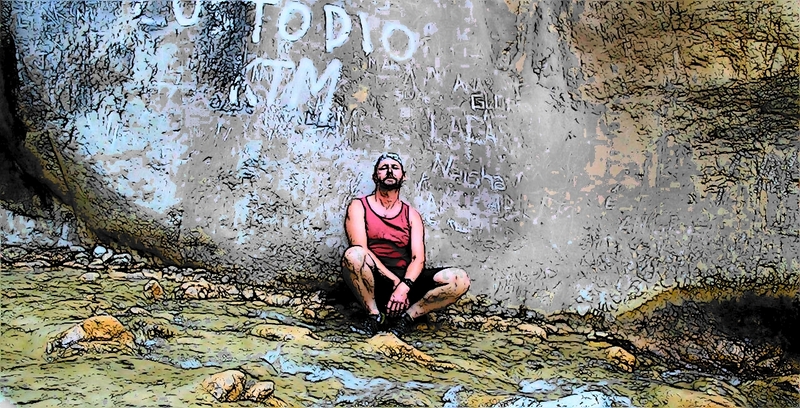 Went to see The Gorge of Rio Higueron on YouTube. I think I will settle for an ordinary swim if I had to choose. Hej Hanna. You are too kind by far. But yes, we have lots of water here at the moment. My garden was under 150mm of water yesterday during the floods and my chickens did not like it at all. All the roads were flooded and the A1M motorway, which is only a kilometre from my house, is still closed. I took a look at the Rio Higuerón videos on YouTube. I think the backing music adds to the drama. It’s a very pleasant walk really and you would enjoy it. There can’t be many walks where swimming and walking is combined. Well done! What an amazing place! Hi Jo. Yes, it’s a great place. And it’s the sort of walk that leaves you feeling really exhilarated. A sit in the sunshine at the end and a couple of beers – just the job. We should do stuff like that every day and we’d feel better for it, I’m sure. Like the look of that place you stayed Alen. Did you fly to Malaga ? It looks like it could be less touristy than the coast. Where did you book the holiday cottage? Just looking at somewhere for next year to look forwards to. Get some sun on my back. I can guarantee it’s warmer and drier than the Orkneys. Sorry about that. I would rather have been in a wet mist on the Grey Corries. I’ve done a few hikes like this over the years in waters swift and cold which is fine on a hot summers day. There are a few times though when it was not the intention and the gully just closed in…and up an through the water was the only way. All adventures. Hi Dohn, good to see you back. Yes, walks like that are certainly adventures. I intend to do more of them where the opportunity arises and the weather permits. That looks brilliant Alen. It is a wonderful area to walk and climb in that’s for sure. It’s a few years since I was down there and it is nice to read about your experiences and see the pics. The gorge certainly looks fun. Makes me want to go back again. Hi David. Yes, it’s a brilliant area. What I like about Spain is that there are mountains everywhere. I read somewhere recently that Spain has the highest land mass of any European country other than Switzerland. And it’s a lot warmer than Switzerland, so you can’t go wrong. Hej Hanna. Thank you very much for that. Thanks Snook. I wish I was there now. Three months later and it’s cold, wet and dark here in England.